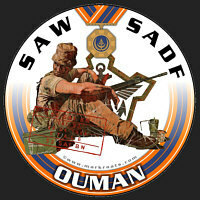 ..:: » About The War » > » About The War In Angola » OPERATION PACKER, 1988 » The Third Attack on Tumpo, 23 March 1988 ::..
82 SA Brigade was ready to attack on 22 March, leading elements of Regiment De La Rey having already moved off to their assembly area at 06h00. Unita's 5th Regular Battalion had arrived as planned and Gerhard Louw was shocked tp find that it had shrunk to fewer than 240 men. They boarded trucks and moved off with his force. The main force moved out in two columns led by the tank squadrons. The last elements had moved off to their assembly area by 15h00. The last stages of the move were hindered by the fact that several of the tanks still had no night vision equipment; that reached them only at 18h00 in the assembly area. The force then moved off to its forward assembly area at 21h00, with the Unita infantry riding on the tanks. A dune caused some delay soon after 02h00. when several of the trucks could not get over it at the first attempt. The Kwevoel carrying one of the mine-rollers burnt out its clutch attempting to get over this dune, and had to be towed. It overturned a little later while being manoeuvred around another dune, and was left behind for the time being. The forward assembly area was reached by 04h00. The drivers' night vision periscopes were removed and replaced with the daylight ones, and the force was ready to move off. Colonel Fouche moved his headquarters to high ground north of the Chambinga at 22h45, and arrived there at 0lh30. He was accompanied by Generals Liebenberg and Meyer, and Colonels Deon Ferreira and Nel. The movement of the various combat elements also went smoothly, the route having been clearly marked by 32 Battalion. Gerhard Louw's combat group moved out of its forward assembly area at 05h00 and reported passing the control point south of the Dala at 06h00. The Mirages arrived over the area at 06h10 but were thwarted by a thick cloud layer at 800 feet, and had to return to base. At 05h15 the artillery observer on the high ground east of Tumpo was shelled by Fapla. At 07h00 Fapla began shelling the 120 mm mortar battery north of the Dala source. This is thought to have been observed fire, as it shifted after every salvo and came nearer to the position each time. By 07h10 the South African artillery was ready to begin its fire plan. The gunners of Regiment Potchefstroom University opened proceedings with a bombardment of the main objective, one gun firing smoke. Fapla replied with a counter-bombardment almost immediately, but it was inaccurate and did not hinder the guns at all. They did, however, carry out a counter-bombardment of their own, which brought a direct hit on one of the Fapla D-30 positions and silenced it. The shelling of the 120 mm mortar battery meanwhile continued. The South African artillery carried on with preparatory and counter-bombardments while the main force advanced. The gun placing smoke on the objective began to develop technical problems after a time, but by then the other guns of the battery were already firing white phosphorus, so it did not matter much. Louw had some navigation difficulties at first, but he was soon back on the marked approach route. Just before 08h00 the forward observer's vehicle began giving problems. Fapla now also began to shell them, though not very accurately. The start-line was crossed at 08h15, ten minutes early. The force was, however, too far west and reported at 08h16 that they were almost on the edge of the Cuito flood-plain. With his force deployed in combat formation but with only one of the mine-rollers available. Louw had to risk advancing through the minefields with his tanks. His force moved up on to the dunes south of the start-line and began its advance to contact. The tank on the far right flank hit an anti-tank mine a little before 08h35. The Fapla artillery reacted immediately, and shelled Louw's force. This shelling was inaccurate, and only one Unita soldier was wounded. The South African artillery fired counter-bombardment from 08h40, and also shelled the Fapla positions in front of the attacking force and their escape routes. An armoured recovery vehicle was brought up and pulled the immobilised tank out of the minefield. The engineers moved up and fired a Plofadder across the minefield at 08h50. This deployed poorly and failed to detonate, forcing the engineers to detonate it manually. The engineer Ratel then moved forward to check the field but hit an anti-personnel mine. Three other anti-personnel mines were lifted nearby. Louw ordered the firing of another Plofadder. This one deployed properly, but also failed to detonate. The engineers now had to sweep their way to the Plofadder to detonate it, walking forward in the midst of the increasingly heavy Fapla shelling. Fapla forces on the west bank now began to react: five tanks and a BM-21 moved up from south-east of Cuito Cuanavale, soon followed by three more tanks. By 10h07 the attacking force was under fire from the tanks on the west bank. The artillery observer brought G-5 fire down on this tank force from 10h15, and one tank was knocked out with a direct hit. By 10h45 the situation had quietened, and Louw's force found itself left in peace for a time. Unita's 66th and 75th Semi-Regular Battalions had meanwhile been doing their work on the west bank of the Cuito. At 10h30 the artillery observer reported heavy fighting in the Bambi area, with Fapla bringing heavy BM-21 fire on to Unita elements there. This fighting was still continuing half an hour later, and the observer reported heavy small-arms and mortar fire in the area at 11h05. The situation was now complicated for both sides by a thick mist that began settling over the general area. The G-5s had shelled the Fapla Forward Command Post at Nancova between 11h30 and 11h50, when rain prevented the forward observer from directing their fire. Fapla's command and control had come to a complete standstill for that period while the command element sought shelter in their bunkers. The observer at the Cuito-Cuanavale confluence was driven out of his position at much the same time, when the 36 Brigade battalion evicted Unita's 118th Semi-Regular Battalion from the area. The result was that there was no longer any proper observation of the west bank of the Cuito. Louw had meanwhile cleared a lane through the minefield with his second Plofadder. He advanced through it with his two tank squadrons, the mine-roller leading, and left the armoured car squadron to cover it. The tanks deployed into combat formation, with A Squadron on the right, and moved off a little after 12h00. Fapla resumed intense shelling of his force at much the same time, and direct fire also began to make itself felt, including some Saggers and fire from several 23 mm guns to his east. By 12h30 his force was drawing so much fire that Louw decided to pull it back into dead ground. The infantry of the 5th Regular Battalion, in particular, had begun to suffer severe casualties - not least to the 23 mm guns. His forward squadron began moving again at 12h45, but again drew heavy artillery fire, mainly from the west bank, which pinned down the Unita infantry. Eight Fapla tanks were also reported to be moving to the crossing point over the Cuito, and Fapla had put in a request for an air attack on the main South African and Unita force. Louw made another attempt to advance, but was again brought to a standstill by intense fire of all calibres. At 13h30 the first of the MiGs were in the air above him to further complicate his situation. He nevertheless persevered with his attack. By 13h46 the attack had, however, stalled again in front of another minefield in which two tanks were damaged. Some of the anti-tank mines in this field were boosted, and Louw was treated to the sight of a complete Olifant suspension unit sailing through the air when one tank detonated a mine. Heavy mortar fire now fell among the tanks, and soon became so intense that the tanks were almost hidden by the smoke and dust. Louw sent back for another Plofadder and moved his mine-roller forward to clear a lane through this new field. It promptly hit a boosted mine, which blew off a rear suspension unit. By now the tanks were also running short of diesel fuel as a result of all the to-ing and fro-ing between the minefields. At 13h48 Louw had reported this problem and suggested breaking off the attack to avoid a situation in which some of the tanks might run out of fuel before they could get back to the forward assembly area. Colonel Fouche agreed with his assessment and at 14h05 ordered him to pull back to the area of the first minefield while he recovered the damaged tanks, and then to move back to the forward assembly area. While the Brigade Headquarters considered the situation, Gerhard Louw had begun making efforts to recover the immobilised tanks. One was pulled out successfully by an armoured recovery vehicle, but the other two proved impossible to recover. His own tank and an armoured recovery vehicle failed even to move the one Olifant that had lost its left rear suspension unit; it simply dug deeper into the sand and became totally unmovable. The tank attached to the mine-roller, also missing a rear suspension unit, was hooked up to three others, but it dug a metre-and-a-half deep furrow in the sand as it was dragged along. The four tanks were reduced to a crawl of about 500 metres an hour, still under heavy fire from a variety of weapons. Louw finally decided to drop off the damaged tank They then encountered another problem. The strain of the heavy tow had been too much for the shackles, and they could not be released. After struggling fruitlessly with the tools carried on the tanks, Louw finally shot through the towing cables and the three towing tanks moved off. The entire recovery operation was fraught with danger, for Louw and his men had to move among the tanks in the minefield, which was known to include a generous proportion of anti-personnel mines. Luck was on their side, and no one stepped on any of them. The tank that Louw had hitched up to his own, however, detonated several anti-personnel mines in the few metres that it moved before it finally dug into the sand; all in the area over which he, his crew and the recovery crew had moved while hitching it up. Apart from the mines, this work was also carried out under intense artillery and mortar fire, spiced with occasional bursts of 23 mm fire. A BM-21 also began to engage the force from 6 000 metres away, shooting directly at them. With recovery impossible in the circumstances, Louw asked for permission to destroy the two immobilised tanks with gunfire. The fire falling around them was by then so intense that it was not even possible for their crews to recover their personal possessions safely. General Liebenberg now intervened to order that the tanks should not be destroyed, but left to be recovered later. Angolan fighters meanwhile again took an interest in these events. Several MiGs attacked Louw's force at 15h03, 'toss bombing' their weapons while some others apparently marked the target with lasers. The attack was unsuccessful; some of the bombs fell as far as 7 000 metres from the South African vehicles. At 16h30 Louw began to move back to the first minefield. In the smoke and dust they could not at first find the cleared lane through it. Louw asked the armoured car squadron to fire some flares to mark the lane, and then took his force through. As they moved back, another tank fell victim to the mines. Its track had been damaged earlier and now broke. With no more cables to tow it, Louw was forced to leave this Olifant behind also. At 17h30 Regiment Groot Karoo was also ordered to break off its operation and move back to its assembly area. The G-2 battery unexpectedly came under quite accurate artillery fire at that point, but suffered no casualties. Louw's force reached Cabarata about last light. They stopped in that area for a time while MiGs flew overhead searching for them in the bush. 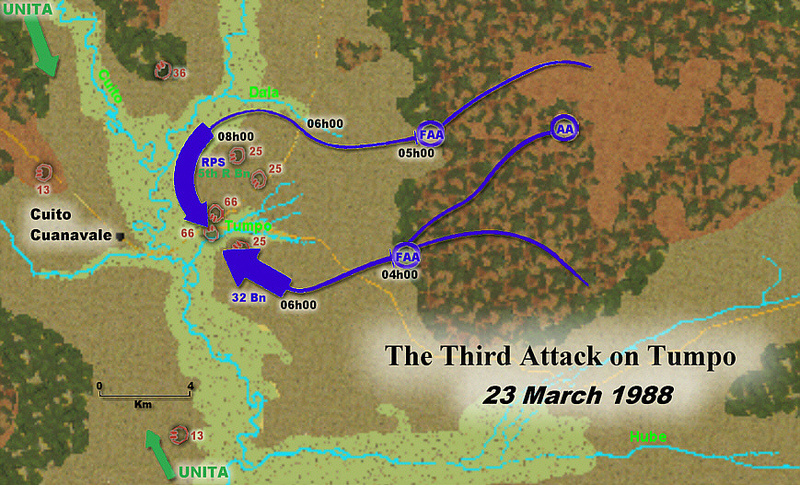 When the artillery fire began to fall too near his vehicles, Louw resumed his move despite the air threat. In the event, the MiGs did not bother him again. He moved his force through the forward assembly area and laagered for the night just out of artillery range. Next morning he handed over to Commandant Schoeman and went to the Tactical Headquarters to be debriefed on the attack. Colonel Fouche moved back to his Tactical Headquarters at 18h39, to consider the situation. The generals accompanied him. The other units that had taken part in the attack also moved back to their assembly areas to repair and maintain their equipment. The third attack on Tumpo had, like the first two, broken down in the defensive minefields and artillery fire. Unita had lost thirteen killed and some wounded. The South Africans had not suffered any casualties, but had to leave behind three damaged tanks. Published by Ashanti Publishing Limited, Gibraltar, a division of Ashanti International Films Limited, Gibraltar.